In the commonwealth of Israel, as among other nations of antiquity, loans of money, or of corn or like commodities, were made as a matter of favor by the wealthy to those standing in need, and but seldom, if ever, in the way of furnishing capital necessary for enterprises in trade or agriculture. At least in all passages of Scripture lender and borrower stand, at the time of the loan, in the attitude of benefactor and dependent (Ps. cxii. 5); after the loan, in that of master and servant (Prov. xxii. 7); and, when the lender enforces his demand, in that of tyrant and sufferer (II Kings iv. 1). It is made the duty of the well-to-do Israelite to lend of his affluence to his poor brother (i.e., fellow Israelite) according to the borrower's wants, at least when a pledge is offered (Ex. xxii. 25; Deut. xv. 8), and that without claiming interest (see Usury); and he should not refuse even when the approach of the year of release endangers the recovery of the loan (Deut. xv. 9), and though the security of the pledge is much weakened by the lender's duty of returning it when the debtor needs it (see Pledge). In truth, to lend is regarded in Scripture (ib. 1-11) as an act of benevolence the reward for which must be expected only from God. R. Ishmael, of the time of Hadrian (see Mek., Ex. xxii. 25), reckons the command to lend to the poor as one of the affirmative precepts; and the Talmud (B. M. 71a) derives from Ex. xxii. 25 the rule that between the Gentile who offers interest and the Israelite from whom it is not allowed to be accepted,the latter should have the preference; between the rich and the poor, one should lend to the poor; between kinsmen and townsmen, lend to kinsmen first, but give the preference to townsmen over those from a distance. To lend is deemed more meritorious than to give (Maimonides, "Yad," Malweh, i. 1); for by a timely loan the receiver may be saved from beggary. The lender or creditor is bidden also, on inferential Scriptural grounds (ib. ; Deut. xv. 2-3), not to press the borrower or debtor when he knows that the latter can not pay; which admonition was so extended by the Rabbis that they forbade the creditor to show himself to the unfortunate debtor, in order that he might not put the latter to shame ("Yad," l.c. xiii. 3). On the other hand, it is a most sacred duty of the borrower to pay if he can. To withhold payment is wickedness (Ps. xxxvii. 21), and, according to the Rabbis, the debtor, when able to pay, must not even put the creditor off, telling him to come again; nor must he waste the borrowed money or lose it recklessly, so that he can not repay it. Under the written law (Deut. xv.) all debts arising from a loan are canceled by the passage of the year of release over them, on the last day (last of Elul) of that year. The text (ib. verse 9) warns earnestly against the baseness of not lending to the poor from fear of such release; yet in the days of King Herod this kind of baseness prevailed among the well-to-do Jews to such an extent that Hillel the Elder, who according to rabbinical tradition was at that time president of the Sanhedrin, in order "that the door might not be shut in the face of borrowers" thought it best to contrive a fiction whereby to nullify the Scriptural law (see Sheb. viii. 2-3; Sifre, ad loc.). He authorized the creditor to execute a deed, known as the "prosbul," in some such words as these: "I, A. B., hereby deliver to you [giving the names], judges of the court at [naming the place], all the claims which I own, so that I may collect them at any time I may choose"; which instrument was signed by the judges and by two witnesses, and the bonds were then handed over to the court. 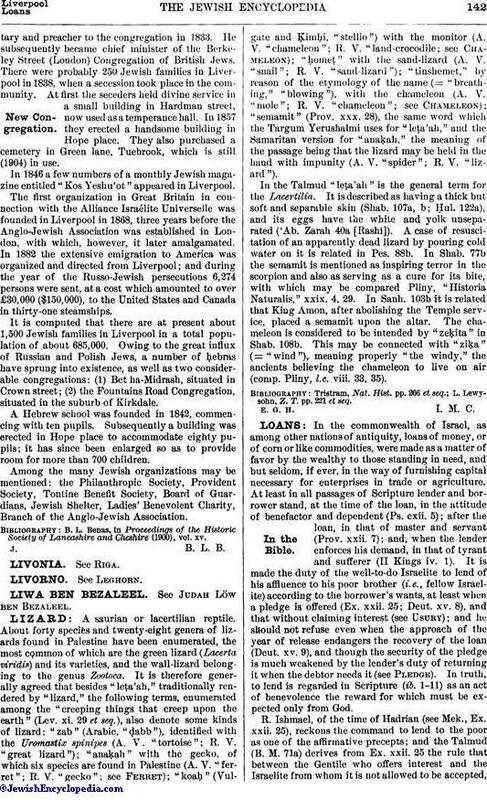 The act of Hillel was justified on the ground that the year of release being indissolubly connected with the year of jubilee and the restoration of lands to their former owners, and the latter being in the second commonwealth no longer feasible, the release of debts ceased to be a Scriptural and became only a rabbinical law, and for good cause might therefore be modified, or even abrogated, by the Great Sanhedrin (see Talmud Yerushalmi on above mishnah). The Sabbatical year, as far as it affected seed-time and harvest, was meant only for the Holy Land; neither did it ever work the release of debts beyond the boundaries of that country. Joseph Caro says, in his code, that as a rabbinical institution the law of the year of release operates in all times and places; but the gloss of Moses Isserles declares that in "these countries," meaning northern Europe, it had fallen entirely into desuetude. 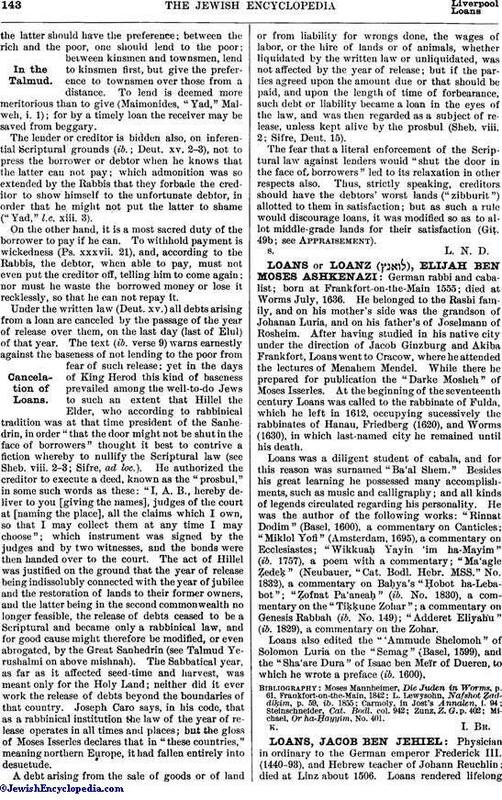 A debt arising from the sale of goods or of land or from liability for wrongs done, the wages of labor, or the hire of lands or of animals, whether liquidated by the written law or unliquidated, was not affected by the year of release; but if the parties agreed upon the amount due or that should be paid, and upon the length of time of forbearance, such debt or liability became a loan in the eyes of the law, and was then regarded as a subject of release, unless kept alive by the prosbul (Sheb. viii. 2; Sifre, Deut. 15). The fear that a literal enforcement of the Scriptural law against lenders would "shut the door in the face of borrowers" led to its relaxation in other respects also. Thus, strictly speaking, creditors should have the debtors' worst lands ("zibburit") allotted to them in satisfaction; but as such a rule would discourage loans, it was modified so as to allot middle-grade lands for their satisfaction (Giṭ. 49b; see Appraisement).